We previously reported on warmer currents that are melting Greenland’s vast ice sheet. Today, the Times drone footage shows a big lake and river comprised of meltwater. Unfortunately, warmer global temps are speeding up the rate Greenland’s ice is melting, so these lakes and resultant rivers are becoming even more common. The number stretches into the thousands. Since there’s only so much data scientists can comb through in a lab, there comes a point where going out into the field is necessary. 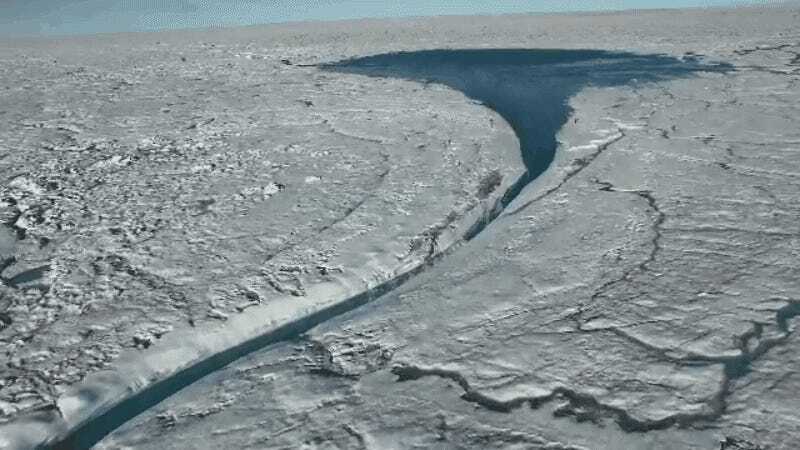 But this rapidly liquefying ice field is treacherous: Rivers form sinkholes in the surface, called moulins. Fall into one, and you’re a goner. That’s why the team turned to drones. The ten-pound, camera-equipped UAVs were used to provide sweeping vistas of just how bad the melting ice has gotten. While the Federal Aviation Administration is still navigating the morass of evolving regulation for commercial and personal UAV flights here in America, the barren expanse of Greeland’s ice fields proved a perfect opportunity to let the drone fly. The challenge? The bitter cold, which dipped as far as nearly 30 below zero, shortened drone battery life to as little as 8 to 10 minutes. Photographer Josh Haner had to swap out memory cards as soon as he got those initial shots, in case the drone was later lost during the mission. A crash landing rounded out the list of scares and hiccups. In the end, though, all was well, and some amazing shots were captured from crazy angles that only a drone could pull off. Hopefully the footage provides researchers—and the public—a better idea of Greenland’s serious situation.